A UK-based IT Infrastructure Firm launched a rectuitment drive that brought a smile to most commuters yesterday, myself included. At 6.30am yesterday morning (Monday), CloudTalent, launched a live recruitment campaign in London to celebrate its plans to recruit 1000 new experts – confirming recent reports of the economy showing signs of recovery. CloudTalent is a UK-based IT Infrastructure consultancy, founded in 2011 by previous owners of The Networked Storage Company, before it was sold to Dell in 2007. In 2011, after years of experience in the industry, the CloudTalent team identified an opportunity to provide consultancy where the client is in the ascendancy – for the first time. CloudTalent then drafts in the knowledge and expertise where needed, allowing change to be initiated and executed quickly, without taking up valuable time of those involved, but still drawing on their understanding of the situation. 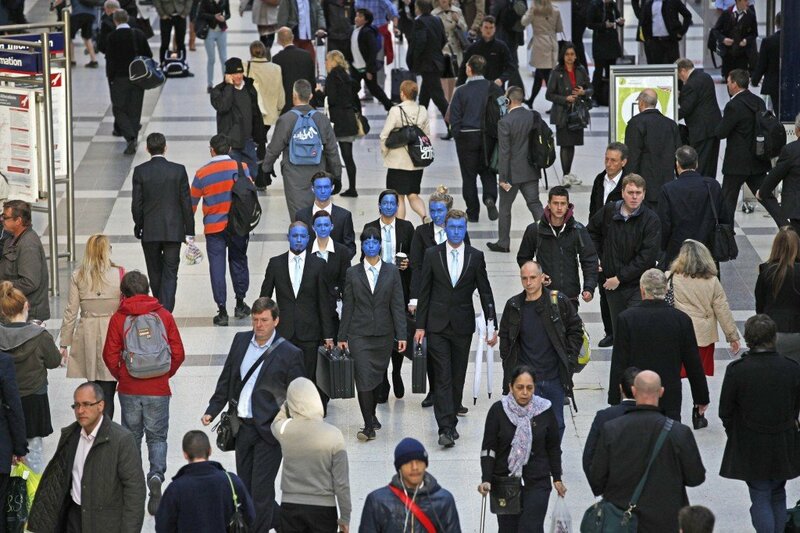 The dramatic campaign involved 20 actors dressed as office workers, with only their heads and hands painted blue, making them stand out against the morning’s commuter traffic. Each ‘Blue Bod’ represented 50 new Associates that CloudTalent is planning to recruit. The campaign was designed to raise awareness of CloudTalent’s plans to take on 1000 new recruits – from subject matter experts through to project leads, to help manage the demand for its fresh approach to IT consultancy. Adrian Overall, CEO of CloudTalent commented on the launch of the campaign: “The industry demand for a fresh approach to IT consultancy has meant that we’re growing at an exponential rate, and the only way we can continue to grow at this pace, is with the support of the right talent. Ricky Lewis, a CloudTalent Associate comments on his / her experience of joining the CloudTalent pool: “Many consultancies say ‘we’re different’ though they rarely are. It was refreshing to join CloudTalent – and learn of their unique approach to consulting”. Mark Hoban, the UK’s Minister for Employment, commented on the campaign: “This is a great example of the growing faith in the strength of the UK economy, which is giving businesses, like those in the IT sector, the confidence to hire more staff. “Just last week we heard that the private sector has created jobs for an additional 1.4m people under this government. There are now more people employed in the private sector than ever before. 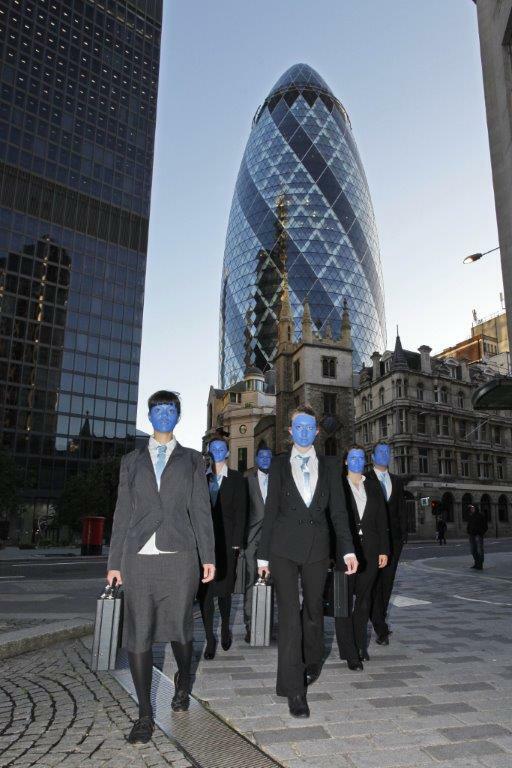 The CloudTalent Blue Bods went about their business amongst other commuters, visiting some key business hotspots including The Gherkin, Bank’s Royal Exchange, Liverpool Street & Canary Wharf. Aside from its futuristic consultancy offering, CloudTalent hosts a regular forum called ‘The Reality Exchange’ where senior IT managers of global, industry leading companies come together to discuss the issues, complexities, and solutions they are deploying on a day-to-day basis. The event is held under the Chatham House Rule, enabling participants to use the information, without identifying where it came from – its participants have dubbed this event ‘the most powerful tool in the industry’.